Home Biliran State of Calamity 2017 Tropical Depression Urduja Tropical Storm Urduja Tropical Storm Urduja Update: Biliran under state of calamity. Tropical Storm Urduja Update: Biliran under state of calamity. Tropical Storm Urduja destroyed bridges and caused landslides - 17 December 2017. According to Biliran Governor Gerardo Espina, Jr Monday morning, Urduja is the most damaging that have been hit the province with its extent of damage that was unexpected with ‘Urduja’s’ maximum winds of less than 100 kilometers, but its heavy rains dumped three days before its landfall was very destructive. ' Landslides have occurred in the towns of Naval, Caibiran, and Almeria. Floodwaters cut off Caraycaray and Catmon Bridges, making Biliran town inaccessible to the provincial capital of Naval. 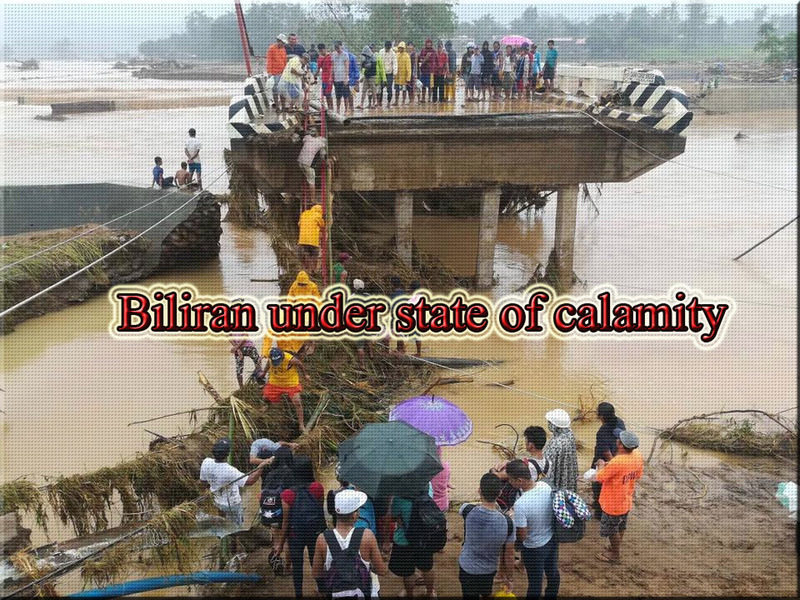 Due to the damages sustained by the province, Biliran has been placed under a state of calamity. The governor also said at least 26 were confirmed dead but only 23 bodies been retrieved as of Monday morning. At least 28 people are still missing. The president was scheduled with some of his Cabinet members (Presidential Spokesperson Harry Roque, Public Works and Highways Secretary Mark Villar, and Agriculture Secretary Emmanuel Piñol) to visit the typhoon-wrecked province on Monday afternoon to assess the damage caused by “Urduja”. Furthermore, according to PNA latest post this afternoon and with the urgent response of the Government, the Philippine Navy will deploy ship for Biliran to bring relief goods and other items that was confirmed by Central Command (CENTCOM) spokesperson Col. Medel Aguilar. "CENTCOM has alerted the Naval Forces Central to deploy a naval vessel that will bring relief goods to Biliran the soonest time possible. Food, water and medicines will be given priority," he added. Areas Under State of Calamity due to Tropical Storm Urduja. PAG-ASA Weather Update for New Tropical Depression that weakens into a Low Pressure Area (LPA) today - 18 December 2017.